The 20V MAX* String Trimmer features a patented gear drive design for amplified torque when powering through overgrowth. The bump feed head provides 13" of swath with DeWalt's 0.080" line. The variable speed trigger offers precise power control as well as performance and runtime management with the Hi/Lo speed control switch. 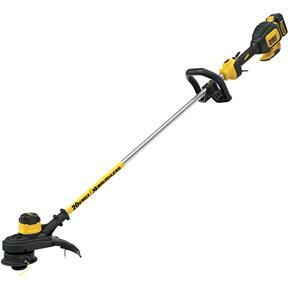 Well balanced and only 8.5 lbs., the string trimmer is easy to maneuver and puts less stress on the user. Includes string trimmer, 1 20V MAX* 5.0Ah lithium ion battery, standard charger, and 0.080" line prewound in spool.